As Ramadan falls on Street Feast this year, we take the opportunity to explore some of the yummy traditions of other cultures. This popular dessert is a must for Eid, the official end of Ramadan celebration, and can be served warm or cold, but the latter is how our friend Asanka prefers it. His family have been cooking this sweet treat for generations, and I for one can attest to its deliciousness. And what’s more, they’ve generously agreed to share the recipe with us! 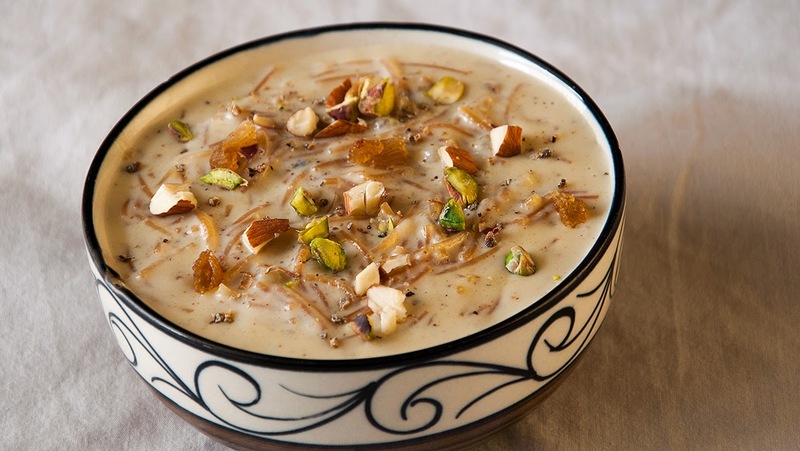 Many households have their own variation of Sheer Khurma: some use cardamom and some use cinnamon, some add chopped dates and some rosewater. It’s a great dish to experiment with, so why not come up with your very own take and make it your Eid tradition? Pinch of cardamom and dash of rose water optional. In a large pot on medium heat, heat the ghee slowly. Add raisins and cook until they plump up, then remove them from the pot and set aside. Add more ghee if pan is dry. Add nuts and toast until fragrant and slightly browned, but not burnt. Remove nuts from heat and set aside. Still using the same pot on medium heat, bring the milk to a gentle simmer, stirring continually to prevent burning. Continue to cook until milk has reduced to about three quarters of its original volume. Whisk in rice flour and sugar until dissolved. Add vermicelli, evaporated milk and condensed milk. Cook over low heat, stirring occasionally, for 20 to 30 minutes, or until the mixture becomes syrupy. Stir in saffron, raisins and toasted nuts, reserving some raisins and nuts for garnish if desired. And bon apetite! Or bil-hanā’ wa ash-shifā’ in Arabic! !